In today’s technology computers plays an important role in our daily life whether it’s for personal use or for business purposes? But if your computer you used is giving you trouble in their performances like slow performances, too much log, too much error or a sudden shutdown in your desktop or laptop? Maybe it’s time to fix or installed a newly and clean installation of operating system. There are several options of computer operating system that are now used in today’s technology, you can either choose Windows XP, Mac OS, Windows 7, Windows 8 or Windows 10? But be sure that your computer is supported by those operating system? 1. Select you preferred operating system that you will use and that supports your computer specifications. 2. Go to Bios setup: in this option entering a key or pressing a key tab to enter the bios setup may be different to other brand of computer motherboard? F2 is the most common key tab to enter the bios. 3. Select the proper boot device: If you are using DVD rom, select DVD rom for the first boot device, so that it will read OS disc when you start the format procedure or you can also use USB bootable device. 4. When the setup started press any key to proceed from booting of the Operating System. 5. Upon reaching the disk options, you have an option if you want to create a disk partition? In creating partition you have to divide local disk c, to have local disk d? or simply format local disk c to proceed without partition. 6. Now format the local disk c: In this options you can either choose format quick or format normally. 8. After the installation is finish, the windows will open. 9. Now that a new and fresh windows is installed, it’s time to install the necessary driver needed to fully use the computer. For desktop user: VGA, Sounds and Ethernet Driver must be installed and for Laptop user sometimes all drivers are already installed. 10. Now if everything was installed successfully you can check the device manager to see to it if there are error or question mark that show if not? Then your computers driver are all installed properly? But if not kindly check the mark errors and try to resolve it? 11. Now install all the program that you will need for your computer and also avoid installing program that you don’t need? It can also lessen the performances of computer of those unwanted programs. These is just my own personal experience on how to format my own personal computers, others setup may be different for some expert on how to format their own computers. 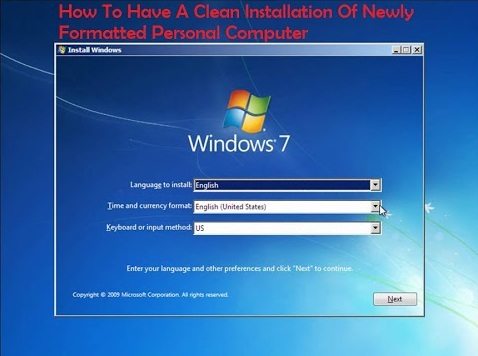 No Comment to " How to Have a Clean Installation of Newly Formatted Desktop or Laptop "